Thank you for supporting SafeMinds Annual Appeal 2016 and have a wonderful Holiday Season! A couple of months ago, a father of a young girl with autism asked me over lunch if I worry about my son’s future, and what I do to manage that “middle of the night” anxiety. You know the feeling. I can’t deny that, like most SafeMinds supporters, I too, have stared at the ceiling in bed, worrying for my son’s future with autism. I’m not just talking 30 years out. I’m concerned because many people with autism are sick, and need constant, experienced caregivers. Autism prevalence is at epidemic levels. More Americans have autism than the number of people who live in Baltimore, or Las Vegas, or Austin. We know about the co-occurring conditions, like gastrointestinal disease, aggression, wandering, seizures, and suicidality. We shudder knowing that the journal, Autistica, published findings this year showing that people with autism live, on average, 18 years less than their neurotypical peers. What is being done to address this tsunami? There seems to be a theme in the federal government and in the mainstream media that all we need is autism acceptance and more services and it will all be ok. But it won’t. We can’t allow the “new normal” to permeate the discussion of autism. And we need your help on this effort. SafeMinds is changing paradigms and outcomes. We’re proud to be growing in size, and grateful that a dynamic business professional and nonprofit executive, Mike DiMayo, has joined our board. SafeMinds’ board member and autism dad Steve Kette serves as the president of the Autism Policy Reform Coalition (APRC). We’re expanding our reach and educating our elected officials on the autism we know isn’t acceptable. Join us. 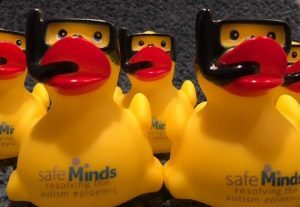 In 2016, SafeMinds co-founded the Autism Safety Coalition, which advocates for national policies that will increase the public safety of people with autism and other developmental disabilities. SafeMinds has met with staff from the U.S. Senate, and the U.S. House of Representatives to advocate for passage of H.R.4919, Kevin and Avonte’s Law, which provides funding for training for law enforcement, community groups, and schools on preventing and addressing wandering in people with developmental disabilities. Though the bill passed the Senate by unanimous consent in July, the House passed the bill with numerous amendments that the Senate could not accept. We’ll be back at it in January with the new Congress. We know many good bills don’t make it on the first try-we’ll work our hardest to make sure 2017 is the year a similar bill passes, and we need your voice. SafeMinds is going to take the opportunity that lies before us. We aren’t accepting the “new normal” because too many people with autism are sick. We hope you will help us on this journey. Recommend the creation of a full-time, federal Autism Spectrum Disorder (ASD) Coordinator, as the federal government’s point person on autism. He/she will be accountable to the President, and to Congress-and most importantly-to us, the stakeholders. Work to establish an Office of National Autism Policy Coordination (ONAPC), which the federal ASD Coordinator will use as a resource to create a national autism strategy. The Office would be accountable to the President and Congress, and to the taxpayers, for researched-based policies that result in measurable positive outcomes for every segment of our community. Continue advocating for, and highlighting research that will make a difference in the health, safety, and well-being of people with autism and those who love them. We are going to fight for a media that reports the truth and protects our community’s best interests. Continue educating public officials and other stakeholders on federal whistleblowers, including the Centers for Disease Control and Prevention’s (CDC) Scientists Preserving Integrity, Diligence and Ethics in Research (SPIDER); CDC senior scientist William Thompson; and the former principal investigator in Utah for the CDC’s Autism and Developmental Disabilities Monitoring Network, Judith Pinborough-Zimmerman. Now how did I answer the second part of the question the autism dad asked me over lunch–specifically, how I manage my anxiety over my son’s future? I don’t get as anxious anymore, because as part of SafeMinds, I am helping to make overdue change happen for our community, and for generations to come. 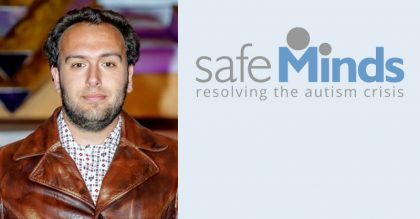 I am proud to be a part of SafeMinds, and to collaborate with its board members, committee members, and supporters. We’re growing, this movement is growing, and we need your help to sustain it. Please consider donating much-needed funds to SafeMinds. Join us. Sustain us. Inspire us. We’ll appreciate whatever amount you can give so that we all will keep moving forward. Ways to give include: DONATE ONLINE or by check made out to SafeMinds 1122 Kenilworth Drive, #307, Baltimore, MD 21204. Thank you, and enjoy the Holiday Season!